It’s a challenge to get organized under the kitchen sink. And even more of a challenge to do it for under $10! Want to know if I was able to do this and what my grand total was? Then keep reading or check out this video. I have found some seriously cheap products for low cost kitchen sink organization that I want to share with you, so that you can diy your own amazingly organized space under your kitchen sink. And my friend Lindsay from Organized to Save has also done her own version of organizing under her sink for $10. Her video is right here! It was Lindsay’s idea to set a budget on this kitchen sink organizing collaboration. Honestly, I was like $10? Really? That sounds impossible! But…I accepted the challenge. And I’m so glad I did because this space turned out SO amazing and I still can’t believe how cheap it was! It’s so easy for the space under the kitchen sink to get out of hand because you’re in the flurry of cleaning the kitchen or maybe you just use it to store all your household cleaners and bottles and wet sponges and dirty gloves all just get thrown in there and…well it just ends up a mess. So, let’s get right into it by showing you the before. I’ve lived in this house for about a year, so I haven’t had too much time to get this area cluttered, but it is just a really dark and dingy space and since it’s so dark it’s really hard to see what’s way in the back. I just have the sponges, bottle brushes and random cleaning solutions thrown in the dark bin on the left and then anything that didn’t fit in there, I have scattered around the middle with the microfiber cloths thrown over the bottles. No real system there. Then on the right, I have my fruit and vegetable cleaner and the dishwasher packets on the very right side because the dishwasher is to the right of the sink, so they are easy to grab from there. The first thing I did was empty out the entire space and give it a good clean. I just used the Green Works natural surface cleaner with a paper towel. Then I laid down some new liner on the bottom of the space. There are all these pipes under the sink, so it makes organizing really difficult since the usable space is such an awkward shape. So, keeping that in mind, I got myself to the Dollar Tree and Home Goods and found a bunch of bright white storage bins and buckets. I looked specifically for white bins because I have the dark wood underneath the sink, so I thought the white bins would brighten up the space a bit and make it easier to spot what’s under there. I found all these items at the Dollar Tree. I didn’t even end up using them all for my under the sink organization, but I wanted to show you everything that I found. The large bin on the right is a nice size with high sides for all those bottles of cleaning solutions. Then, they had these nice little paper labels with strings. I decided not to use those, but am definitely keeping them for a future project. I thought $1 for 30 was a great bargain. The skinny bins on the right came in a set of 3 and looked like they might work for the bottle brushes too. The rectangular bins on the left came in a set of 2 and looked like they might be the perfect size for my extra sponges. The tall bin is a mini trash can and I was thinking would be great to store my bottle brushes, but I ended up not using that. 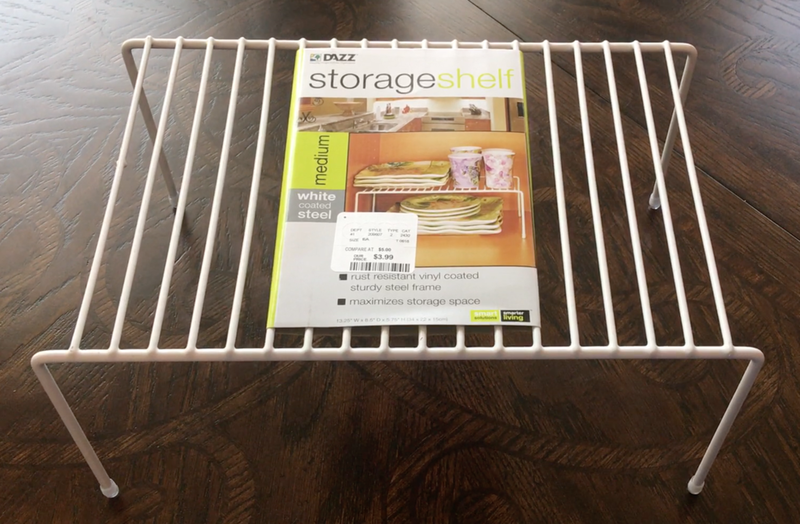 From Home Goods, I found this nice white vinyl coated steel rack that gives you a stackable space. This was only $3.99 and feels really sturdy. For my dishwasher packets, I knew I had lots of glass vases, so I dug around my vase cabinet and found a low profile one. I always leave my dishwasher packet bin open anyway so that it’s easy access, so didn’t feel I needed anything with a lid. I’ve never had any trouble with them drying out or anything. My main goal was to make them as easy to access as possible. So, when I did my redo of this space, I wanted to keep as much of the existing products down there as possible, to give you an accurate feel of what the right storage solutions can really to do a space. So I didn’t just toss a bunch of stuff to make it look less cluttered. These are the same items I had before, just in a different configuration. So are you ready for the after? Get excited! Here is a reminder of the before. Much brighter, everything has its own place, it’s so much easier to see each item that’s under there now. The large bin ended up housing all the bottles of cleaning solutions. That small rectangular bin was the perfect size for extra sponges and my fruit and vegetable cleaner, which I wanted to keep separate from my household cleaners. Then the skinny rectangular bins were the perfect size for my bottle brushes and the one of the right has my drain stop and dishwashing rinse aid. And on the very right, the stackable rack has my vase on top with the dishwasher packets and below are my microfiber cloths. Oh, I just thought of a great way to use that trash bin – it can be for the dirty cloths! I might just throw that in there. Want to know what the grand total was for this makeover? Well, this was a successful challenge AND I came in under budget, which I really didn’t think I could do! I hope you found some great ideas here for your own under the sink organization project. And if you liked this post, please share with a friend! Don’t forget to check out Lindsay’s video, if you haven’t already. Thank you so much for reading, and I hope you have a happy day!